Still Lifes are works of art depicting primarily inanimate subject matter, typically commonplace objects which may be either natural, such asfood, flowers, plants, rocks, or shells, or man-made items like drinking glasses, books, vases, jewelery, coins, pipes, etc. Still Lifes originated in the Middle Ages and are found in Ancient Greek and Roman art. Still life paintings give the artist more flexibility in the arrangement of design elements within a composition than do paintings of other types of subjects such as landscape or portraiture. Still life paintings, particularly pre-1700, often contained religious and allegorical symbolism relating to the objects depicted. Since the 16th century, the most studied and well known allegorical still lifes have been in the form of “vanitas” paintings which depict the transient nature of life and of all earthly goods and pursuits. 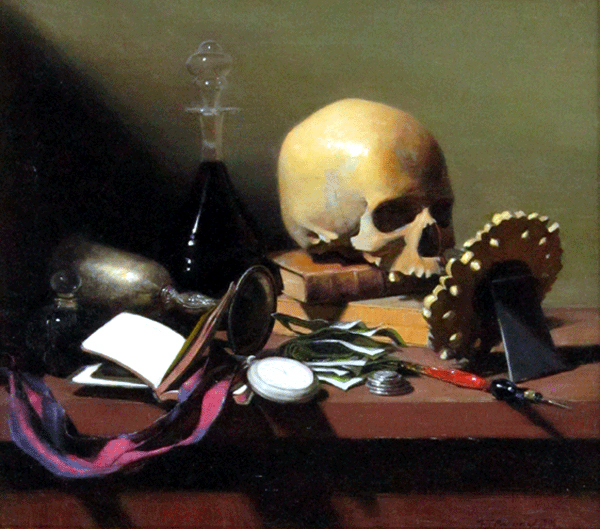 Vanitas still lifes are easily recognized as they traditionally all include skulls, which are a reminder of our mortality as well as various other reminders of the brevity and transience of life as well as our distractions. Clocks, smoke, hourglasses and other artifacts of life are usually present and give the viewer much to contemplate and feel. In modern times, still life paintings have begun to break the two-dimensional barrier and employs three-dimensional mixed media, and use found objects, photography, computer graphics, and even video and sound.